The summer of 1989 was a proper one. In recent years, Britain has grown accustomed to summer months sullied by relentless rainings and gusty scathe. But the summer of ’89 smoldered meanly from moon to moon, broodingly frottaging the mythological instincts of artists whose mission was to inscribe history with a blunted edge. The Portoman Era stretches out at this stage, Gage and Bargefoot establishing a new mode of operation that would involve driving from Cardiff to Bridgend for afternoon/evening sessions after work during which an EP’s worth would be recorded, or some tracks completed bar the vocals for Heaving Stews to overdub. 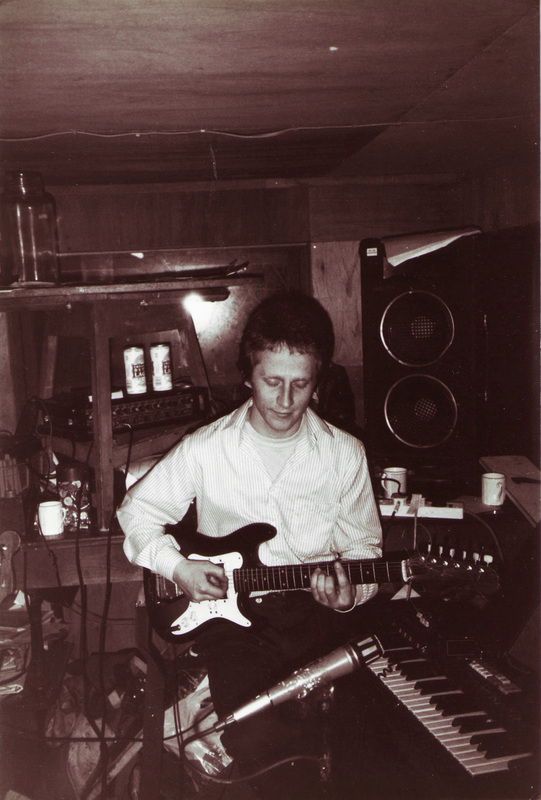 That was sort of the basic pattern, but it’s more complicated than that: sessions would fold over into each other – when Stews came to record his parts for this album, Kate Talyor and Bargefoot’s brother Niklus (making his final appearance) also trundled into the Shed and new tracks were laid down which Gage and Bargefoot later added to. All of which began the accumulation of yet more surplus material, most of which finally gets forced into commodity through the release of the 52nd album, I’ll Never Fall In Love Again, which finally put the Portoman Era to rest. That album thus features the remaining tracks from the session that produced ‘Finger,’ featured here, which epitomizes that spirit of making art between sapping shifts – Gage was then working for Cardiff Theatrical Services (CTS) who were the Welsh National Opera’s stage set people, although they also outsourced, of course; in the run-up to Glyndebourne, Gage had been made to work a 36-hour, non-stop shift, mostly painting scenery… The way he felt afterwards, having yet not slept at all, is expressly described in ‘Finger,’ simply because his head had nowhere left to look, captive to hallucinations and attacks of paranoia brought by exhaustion. 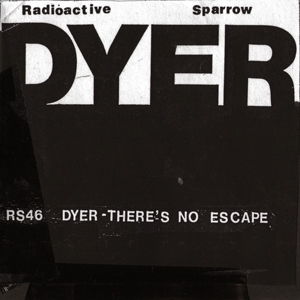 By and large, Dyer… is one of those albums that litter the rock scene, featuring two or three timeless classics in amongst a selection that feels like clock-punching filler. ‘In Pursuit Of Pain’ and ‘Season To Be Sad’ have since featured on most Radioactive Sparrow Best Ofs, the former being on of those songs the band felt comfortable playing again towards the end of gigs, no rehearsal needed, and usually well received by audiences, partly because of how it’s played. As a one-off, Bargefoot invented a whole new drumming technique for ‘In Pursuit Of Pain’ which involved allowing the bounciness of drum skins to dictate the actual rhythmic interplay between hands and timbres; it was piss easy to reproduce in concert, if required. Unlike Bargefoot and Stews, whose waywardness and musical incompetence has long flavoured Sparrow with that crucial Kak-U-Phonic tinge, Tony Gage and Richard Bowers are genuinely talented and naturally competent instrumentalists. Much will be made in posts to come of how Bowers sees the beat like Borg saw the ball, but consider here, on ‘Chat-Up Line,’ Gage’s ability to rigidly maintain a ¾ beat that he has only been played once from the Casiotone keyboard, faultlessly retaining the tempo in order to play along with the original without being able to hear it. Stews’s ‘Chat-Up Line,’ the other stand-out track, was inspired by one of the hundreds of straight-to-VHS USA cheapo horror videos the band were watching week-in, week-out during this period. This particular movie, the title long since forgotten, was about a guy who liked to set his girlfriends on fire… Part of an immense world of films whose legacy remains uncharted because no one has really taken on the critical task of revisiting them in detail. Will this ever happen? It would have to be a Sparrow fan, no question. 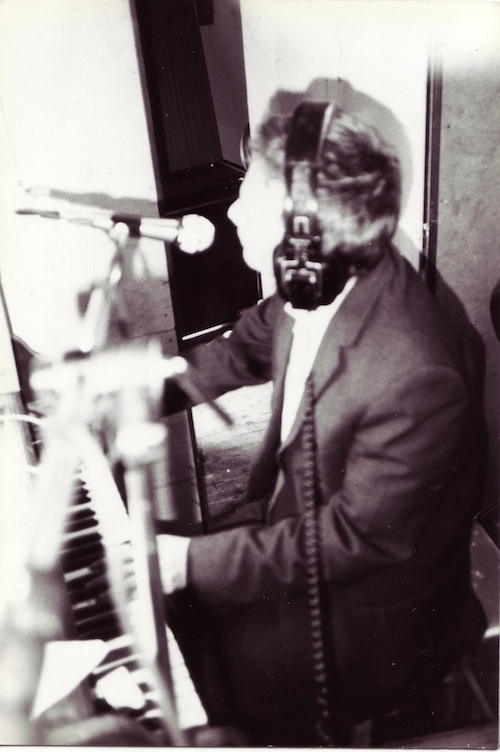 Recorded on late May & early June 1989 in the Hut, Ewenny.